Rocket Lab, an American-New Zealand aerospace company, has completed an internal review of data from the firm's May 25 test flight of its Electron rocket — the review found the launch had to be terminated due to an independent contractor’s ground equipment issue, rather than an issue with the rocket. Rocket Lab’s investigation board has identified the root causes and corrective actions. The Federal Aviation Administration, the primary body responsible for licensing the launch, has overseen Rocket Lab’s comprehensive investigation and will review the findings. The company’s engineers have spent the last two months working through an extensive fault tree analysis to ensure all factors that may have influenced the outcome of the launch were thoroughly evaluated. The investigation involved the review of over 25,000 channels of data collected during the flight in addition to extensive testing at Rocket Lab facilities in California and New Zealand. Rocket Lab’s investigation team determined the launch, named ‘It’s a Test,’ was terminated due to a data loss time out, which was caused by misconfiguration of telemetry equipment owned and operated by a third-party contractor who was supporting the launch from Rocket Lab’s Launch Complex 1. Four minutes into the flight, at an altitude of 224 km, the equipment lost contact with the rocket temporarily and, according to standard operating procedures, range safety officials terminated the flight. Data, including that from Rocket Lab’s own telemetry equipment, confirmed the rocket was following a nominal trajectory and the vehicle was performing as planned at the time of termination. Rocket Lab’s telemetry systems provided data verifying Electron's capabilities and provided the company with high confidence ahead of their second test flight. The telemetry data loss that led to the termination of the flight has been directly linked to a key piece of equipment responsible for translating radio signals into data used by safety officials to track the vehicle performance. It was discovered a contractor failed to enable forward error correction on this third-party device causing extensive corruption of received position data. The failure was first indicated by the fact that Rocket Lab’s own equipment did not suffer similar data loss during launch. Further confirmation of the cause was demonstrated when replaying raw radio-frequency data — recorded on launch day - through correctly configured equipment also resolved the problem. The fix for the issue is simple and corrective procedures have been put in place to prevent a similar issue in future. No major changes to the Electron launch vehicle hardware have been required and the company has authorized the production of four additional launch vehicles as it prepares for commercial operations ahead of the test flight program. 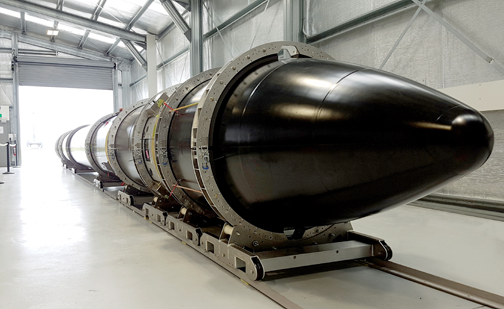 Rocket Lab’s second Electron rocket, named ‘Still Testing,’ is undergoing final checks and preparations ahead of being shipped to Rocket Lab Launch Complex 1 shortly. Peter Beck, the Rocket Lab CEO, said that the company has demonstrated Electron was following its nominal trajectory and was on course to reach orbit. While it was disappointing to see the flight terminated, in essence due to an incorrect tick box, nearly everything has been tested, including the flight termination system. The company is pleased with the amount of data that was collected during an exceptional first test launch.